The Chinese character 文 (wén) stands for language, culture, literature, or a literary composition. As an adjective, it conveys the meanings of being elegant, refined, and gentle, and is also used to refer to scholarly, literary, and cultural pursuits. 文 (wén) is a complementary Chinese concept to 武 (wǔ), which refers to military affairs and martial arts. These two concepts represent the perfect combination of skills and qualities that a person can have. 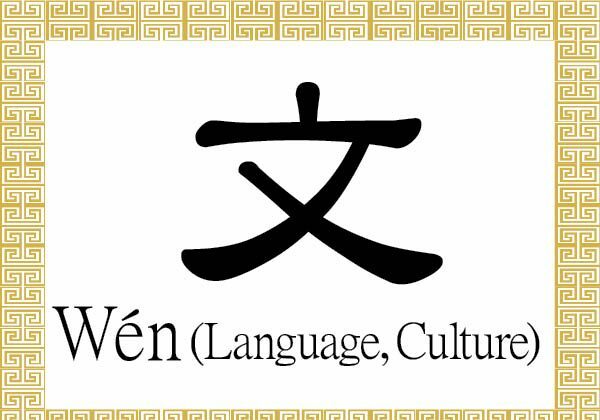 Examples of terms that use 文 (wén) include 文章 (wén zhāng), an essay or article; 文化 (wén huà), culture, cultural, or civilization; 文明 (wén míng), civilization, civilized, or culture; 文件 (wén jiàn), a document; and 文學 (wén xué), literature, literally the learning (學, xué) of literature. The Chinese language is called 中文 (zhōng wén). 中 (zhōng), which means “middle,” refers to 中國 (zhōng guó), or China, literally the “middle country” or Middle Kingdom. The English language is called 英文 (yīng wén). 英 (yīng) stands for 英國 (yīng guó), which can be used to refer to Britain or England. As an adjective, 英 (yīng) conveys fine qualities such as being superior or outstanding, heroic, brave, bright, and flourishing. 天文 (tiān wén) refers to astronomy, literally the “language of the sky” or the “culture of the heavens,” where 天 (tiān) stands for sky or heaven. 重厚少文 (zhòng hòu shǎo wén) describes speech or conduct that emphasizes qualities such as generosity, sincerity, and honesty, while containing little rhetoric. The phrase 道德文章 (dào dé wén zhāng) conveys the idea that writings (文章, wén zhāng) are meant to serve as a tool for expressing virtue (道德, dào dé). It refers to having a high moral character combined with scholarly knowledge. 言之無文, 行之不遠 (yán zhī wú wén, xíng zhī bù yuǎn) states that speech without literary richness or grace will not be able to spread far and wide. The Chinese character for “military” conveys the qualities of being warlike or fierce, as well as being brave, courageous, valiant, powerful, or formidable.